Hi, Folks. It's not that I have nothing new to say about mass shootings. It's that I've already said 90% of it; here, and here; and what little new I might say is not going to change anything, I may say it, eventually, but if you're like me, the pain and embarrassment of belonging to our species is just a bit much to handle at the moment. Actually took quite a bit of work with the camera to get it blurred approximately right. Last time I asked the optometrist what my uncorrected vision was nowadays, the answer was "Oh, around 20/230 at this point. " That's beyond legally blind. I've had glasses since the 3rd grade; so, used to it. In general when people see an image like this, the first impulse is to "fix it" - and put it back in focus. But the world looks like this to me any time my glasses are off; so - I still look. Is there something to see? 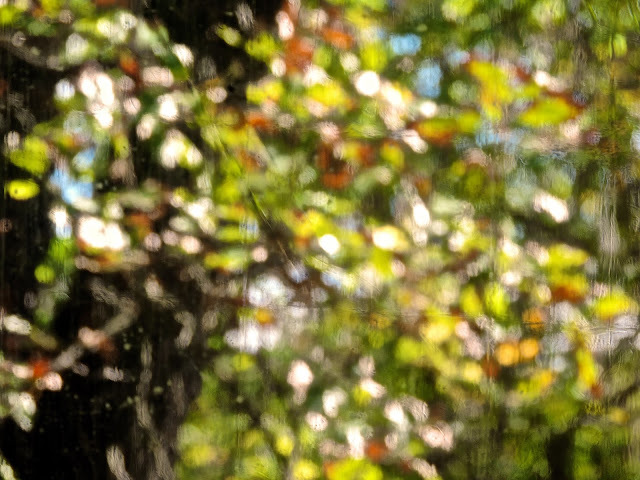 The impressionist blurred fall leaves out my window looked quite lovely to me. A little more than the camera can capture, because there was always a little movement from light wind. Very nice. So of course I put my glasses back on, to see what it really looked like - and it looked like nothing at all; the gorgeous display vanished into some sharp separate bits that just did not have any impact. At all. I took the glasses back off, and just settled back and enjoyed the Monet/Van Gogh Autumn. That view is lovely - highly evocative of the season, for me, and "enough", all by itself. Coffee and - perspective; this is reality too. Comfy. Move around a little for a different view and - the whole woods is a landscape out of a museum. This made me recall that I have long felt sorry for people with normal vision- because they can't take their glasses off, and see this way. That first struck me when I was quite young, probably in the first year I had glasses. We were putting up the Christmas tree; and I was given the job of crawling under it to adjust the stand a bit- and a wayward branch took my glasses off. Looking up through the tree, the world opened up, and the magic expanded manyfold. The tree lights changed into fantasy stars, with scintillating points; the ornaments now reflected the lights with about 50 times the shimmer. I stayed under the tree; on my back, glasses off - until the family started to wonder if I was ok. Then I did have the fun of telling my sister, also a glasses wearer, about the phenomenon. She crawled under, after a lot of convincing; and had the same epiphany. "Ohmylord. It's so much more beautiful!" My brothers - don't wear glasses, and could not understand. I've climbed under every Christmas tree, every year, and repeated and recaptured. It's a very durable joy. Normally sighted people can kind of replicate it by squinting so that the eyelashes obscure most of the world - but the squinting part is an effort and intrusive. Us legally blind folk are the lucky ones here. Sometimes - the world looks better with your glasses off. It's still the world, and reality - but maybe a little easier on us than all the hard edges. I recommend it. Painting that were to change the course of art history. Also, that I too have terrible vision partly genetic and partly because of stupidity in seventh grade science class involving hydrochloride acid. I had no depth perception at all until I was fifteen, which made me very clumsy. But I remember lying face up under the Christmas tree, looking up through all the branches and lights, and feeling blessed by the beauty. Thanks for your post. It was wonderful. A beautiful thought, to appreciate the softer edges. Wow. I know painting tought me to see detail lost to others. Your writing tells me I can get lost in the detail and lose the beauty. Maybe spending too much time on the internet does the same thing. I seem to be hounded by, stories of a flat earth, conspiracies, and warning that hell will break out when they try and take my guns. I think I'll spent some time laying under my pine trees watching the clouds going by.